KawaiiPunk - Kawaii Mascot Blog: Super Cool Snow Slushies! Yes, I’ve taken the Frost Mascot’s suggestion to heart, and created for you these sensational Snow Slushies! Granted, like my previous creations, these aren’t actually functioning slushies, but I’m sure you get the idea. 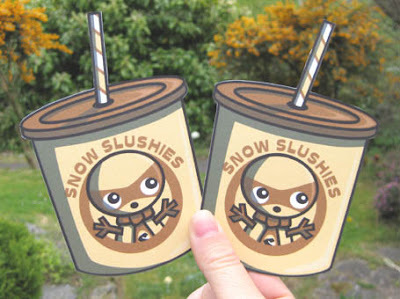 And, if they were real, I’m sure you’d agree they’d be the most flavoursome slushies around! Anyway, I hope you enjoy these super cool creations, and I eagerly look forward to hearing a lot more from you once these horrid summer months are over! Ginger “Freckles” McRedhead. Aged 34.